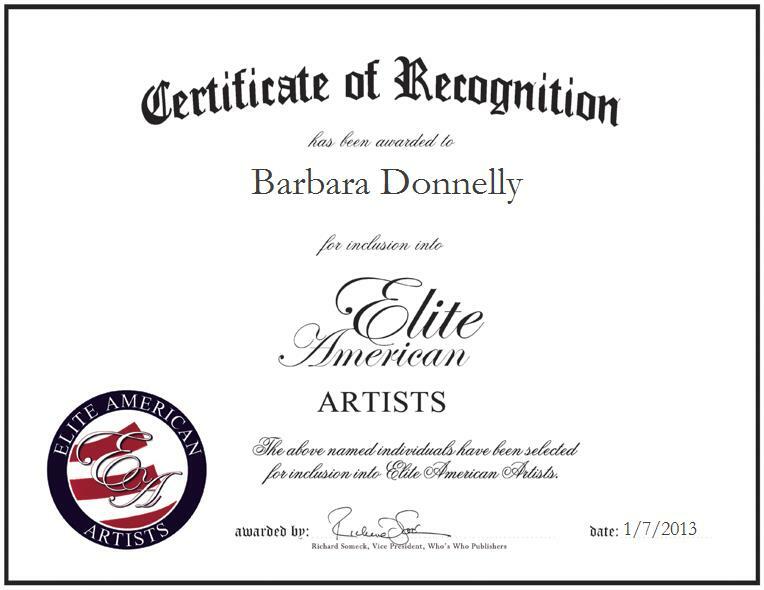 GLOUCESTER, MA, January 7, 2013, Barbara Donnelly, Artist and Owner of the Barbara Donnelly Art Gallery, has been recognized by Elite American Artists for dedication, achievements, and leadership in the fine arts. For more than four decades, Ms. Donnelly has been nurturing a growing skill set and emergent artistic talents, and she continues to strive for excellence in her every endeavor. She specializes in the use of watercolors and oils, and she paints boats, harbor scenes, people, architecture and still life. Ms. Donnelly produces all of the artwork featured at her gallery, manages her business, works with customers, and also teaches workshops. Ms. Donnelly was also a TV federal courtroom portrait artist for channel 56 Boston for eight years and has participated in numerous art shows. She has traveled to France, China, Ireland, Scotland, Portugal and Canada for her artwork. She served as an exhibitor at the North American Watercolor open in 2012, where 489 paintings were submitted and only 67 were chosen—Ms. Donnelly’s piece was one of them.